Home > Newsletter > 2019 > Week 13 (2019) – Vaccinations? I get emails and questions continually about vaccinations but try to refrain from writing about it too often. There are interesting events making it important to update everyone. An area of New York called Rockland has virtually banned ‘unvaccinated’ young people under the age of 18 to come out of their homes. This is because a small number of people have gotten a condition which the medical system call measles. I take this as a form of blackmail to force everyone to have their children vaccinated in spite of the vaccination damage done to some children. The medical system tries to claim there are no side effects with vaccinations but that is a lie since millions of $ in compensation are paid out to vaccine victims in the USA by the ‘vaccination compensation’ scheme. They even pay this out without the need to sue anyone simply to keep them quiet. I have just been to Australia and they are trying to implement the banning of unvaccinated young people in public in the whole country. This is a form of Medical Fascism (Nazi?) with frightening possibilities. The weirdest news is from Germany. A recent episode in Germany created a ‘suppressed’ stir in the field of microbiology when microbiologist Dr Stefan Lanka offered an award of 100,000 Euros to anyone who could prove the existence of the measles virus. Members of the medical system claimed to have proof and took him to court and at first, it appeared he had lost. Dr Lanka took his claim to the highest domestic court in Germany with more experts and the backing of two independent laboratories. He wound up not having to pay. This highest German Federal Court confirmed that there was not enough evidence to prove the existence of the measles virus. Personally, I have not believed in the virus theory for 25 years since I found that there is no one who has ever seen a virus and the health problems blamed on this ‘non-existent’ virus are based upon a poor lifestyle. Poor breathing, poor diet, lack of critical minerals, inactivity, and not drinking water to name a few. My newsletters and books have never wavered for nearly 20 years with the solution to get and stay healthy. To Jab or not to Jab? That is the question. My answer with vaccinations is make up your own mind but either way, have the healthiest children so they will deal with life (with or without vaccinations). My answer with FLU (influenza) is no. More to the point those who have the FLU jab are at a greater risk of getting FLU. See more below. But, Where Does That Leave Parents? Whether you plan to have your children vaccinated or not you should still be ensuring your children are super healthy. I am sure you are not prepared to gamble with your children’s health. You can take the best insurance to prevent disease or vaccination damage by helping your children to become super healthy. To start you have to demonstrate the healthy life you want them to live. The old saying, ‘No Matter How Hard You Try Your Children Will Take After Your Worst Faults’, should be etched into our mirrors. We and our children can follow the basic health plan, walking, stopping starchy carbs and high sugar foods replaced by vegetables, supplementing missing minerals, taking a super multivitamin/mineral such as Active Life, taking Probiotics, drinking water, and more. It is my guess that more children will have more psychological and physical problems not following this healthy lifestyle than those who do follow a healthy lifestyle and have a vaccination. If your children are following a healthy lifestyle and have the vaccine then they can always detox the mercury and other toxins immediately afterwards. Can I guarantee we will be OK to have vaccinations? The answer is no but that is also the answer you will get from doctors who are pushing vaccinations. If they say they can offer a guarantee then ask for it in writing. A 2017 study published in the Vaccine journal discovered that women who received the pH1N1 flu vaccine for two years in a row had an increased risk of having a miscarriage within 28 days. Most post-flu vaccine miscarriages took place in the first trimester, with some in the second. The new research supported the many claims made by pregnant women who reported miscarrying hours or days after having their flu shot. with almost eight times the risk of miscarriage. There are three groups of people: really healthy people, really unhealthy people and then everyone else who are somewhere in-between these two. The difference between healthy and unhealthy is directly related to the amount of starchy carbs and high sugar foods and drinks consumed. Eating a really healthy foods diet is your best bet for a strong immune system. Since we are approaching the season when more carbs and sugar are consumed compared to any other 4 month period, I have some recommendations to avoid FLU and COLDS. number of deaths from infections. 1st Line is probably the most powerful natural supplement for quickly building your natural defences. 1st Line naturally elevates Thiocyanate levels within the body that supports the immune system to battle many types of infection. 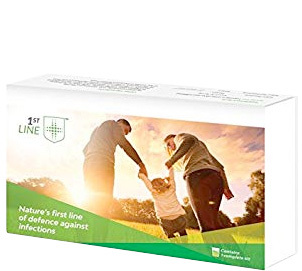 The 1st Line formula is patented by a British Chemist and is added to water and forms the same molecules that make up our body’s first line of defence against all types of bacteria, yeast, fungus, flu, germs and viruses. Unlike antibiotics, 1st Line doesn’t destroy healthy bacteria in the body. 1st Line is safe, easy to use, a one-time treatment and has no harmful side-effects. I recommend for those at the greatest risk to take one dose every day for a week and then one per month. It can be used by people with a compromised immune system to prevent sickness, colds and flu and to stay healthy on a monthly basis. Many years ago I set out to create the perfect formula to keep us healthy and to avoid the infections that occur as we get older. At aged 73 I take this every so often to keep healthy. Below is a review of the factors explaining why each ingredient (x10) was selected for the formula. It explains in detail as to why it is the best formula you can get (in my opinion) for a strong immune system. This unique blend of ingredients (x10) can only be found together in Daily Immune Protection or D.I.P. as I refer to it. Without a strong balanced immune system and a corresponding strong immune system response, our bodies are incapable of dealing with even the smallest and seemingly most harmless infections. By activating an immune system response, either through the innate or adaptive immune system. The responses of these immune systems are characterized first by the body’s recognition of foreign invaders and their antigens (proteins located on the invader’s cell surface) and secondly, its response (attack) against them. D.I.P. balances and stabilizes both the innate and adaptive immune system responses in the body. This is because D.I.P. is an immune system “balancer” as opposed to other immune products, which try to artificially bolster the immune system. 1st line Immune Kit – Your body’s first line of defence against infection. Daily Immune Protection (DIP) – Not just an immune booster, DIP ALSO balances immune response for optimal performance. Prescript Biotics – This is my recommended Probiotic. If you take a probiotic you should really consider this. CureC – Absorbs in the mouth and is the nearest thing to intravenous Vitamin C you can buy. HydroSol Silver Spray – The best silver on the market to supercharge your immune system.